Lady Gabby has requested that I find some Jeffrey Campbell like shoes for under $100! So I picked a few pairs and found some matches! I wasn't sure what pairs she wanted so I chose random ones...haha. The smaller bottom ones are Jeffrey, and the larger ones are not. I think I might need that gorgeous bootie you own! I LOVE those floral oxfords. Great job!! I love the Madden Girl wedges especially! 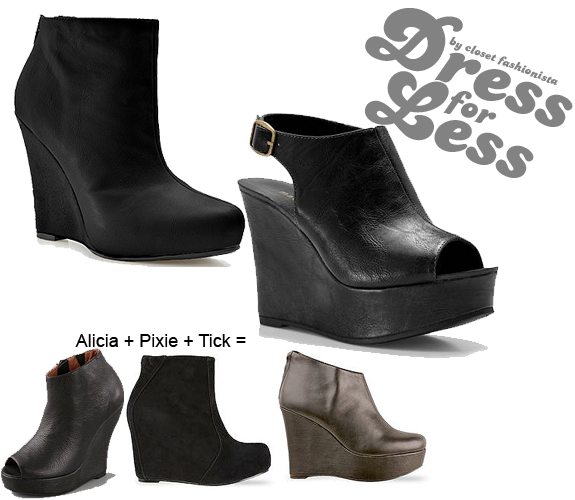 I love the wedges that you picked - the prices are great and I love the styles. I've seen a few of these wedged heel boots and i love them! The R2 wedges that you have look expensive! Cant believe they're only 50 bucs! Beautiful shoes. I love them all. great finds!! these are amazing! Fabulous blog! Just found your lovely comment in my spam folder, major offense... Thanks for the sweet comment love! those are great pics! i always love his shoes but i've never bought a pair -- clearly i have to check out DSW! p.s - love your purple dress from the post down below! Hei, those wedges are amazing right? By the way thanks for dropping by at my blog. LOVE the wedge booties in the upper left hand corner..yummy!!! 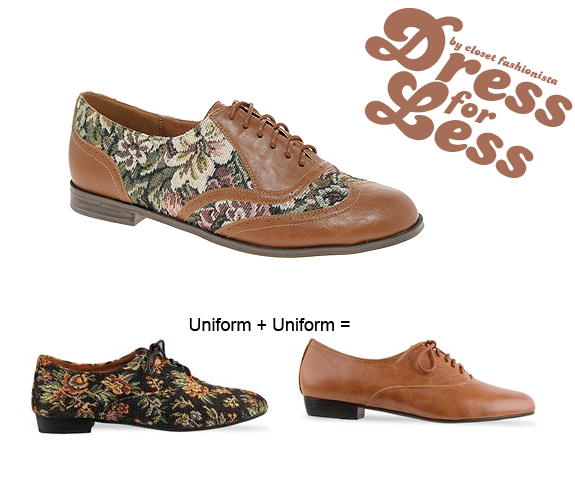 Oh my goodness, I'm in love with the fabric/faux leather oxfords... finally a pretty vegetarian shoe! Unfortunately they don't have half sizes... Le sigh. I really like both of those shoes, I actually got a silver version of the brown one. But I am still looking for the first one. Nice post! I love shoes, yes I do. I STILL need to get my ASOS order in! Those boots! Just wish that my feet could afford walking on those heels! Awhh.. the prints on those oxfords are so pretty! I am not a big fan of the first pair of wedges. The second one is very cute. Very good alternatives! And what do you think about Lita? These are great finds. They all look expensive. The wedges are great. those madden girl open toe wedges are so cute! I adore every type of shoes...and these are very glamour!